Tesla boss Elon Musk has hit back at a top US financial regulator, saying its oversight system is "broken". His comments came after the Securities and Exchange Commission (SEC) asked the courts to hold him in contempt for violating a settlement aimed at limiting his social media comments. 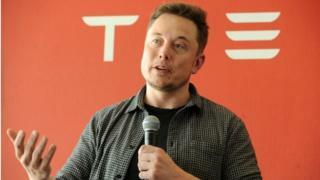 The rule was imposed after he upset markets in August with tweets about taking Tesla private. The judge has given Mr Musk until 11 March to formally respond. However, Mr Musk has already defended himself on Twitter. He argued that the offending tweet, a prediction of the electric car firm's production rate, replicated comments he had already made on a call with financial analysts. "SEC forgot to read Tesla earnings transcript, which clearly states 350k to 500k. How embarrassing ..." he wrote. "Something is broken with SEC oversight," he added later. How did the tweet controversy begin? Last year, Mr Musk agreed that he would not make statements about Tesla's financial performance without prior agreement with the company. The rule was part of a settlement reached after the SEC accused Mr Musk of misleading investors with a tweet in August that claimed he had secured funding to take the firm private. US authorities also ordered Tesla and Mr Musk to pay a $20m (£15.2m) fine and forced Mr Musk to relinquish his role as chairman for three years. In court papers filed in New York on Monday, the SEC said Mr Musk did not follow the Twitter protocol agreed to in the settlement. It pointed to his Twitter activity last week, in which he posted an aerial picture of thousands of new Tesla vehicles, and followed that by saying he expected the firm to make 500,000 cars in 2019. Mr Musk later clarified the tweet, saying he "meant to say" that he was referring to an annualized production rate - not overall deliveries. However, the SEC said the tweet was inaccurate and in breach of Mr Musk's agreement, noting that it was disseminated to more than 24 million people. "Musk has thus violated the Court's Final Judgment by engaging in the very conduct that the preapproval provision of the Final Judgment was designed to prevent," the SEC wrote in its motion filed on Monday in federal court in Manhattan. The filing prompted a sell-off in Tesla shares in after-hours trading. But the price rebounded on Tuesday. The exchange renewed questions over Mr Musk's judgment, which attracted scrutiny last summer after a spate of erratic behaviour. Mr Musk has remained defiant, despite the SEC penalty and investor calls for stronger oversight. In an earlier interview with news channel CBS, he said that he had "no respect" for the SEC, but he had chosen to pay the settlement fine because he believed in the justice system.